NASA has detailed experiments with a new type of parallel array of small electric propellers on the leading edge of the wing technology that they are calling LEAPTech. The press release notes that the benefits include: "Each motor can be operated independently at different speeds for optimized performance. Key potential benefits of LEAPTech include decreased reliance on fossil fuels, improved aircraft performance and ride quality, and aircraft noise reduction." A Popular Science article notes that: "When complete, LEAPTech’s planned cruising speed will be 200 miles per hour, with a range of 230 miles on electric power and 460 miles when running as a hybrid. 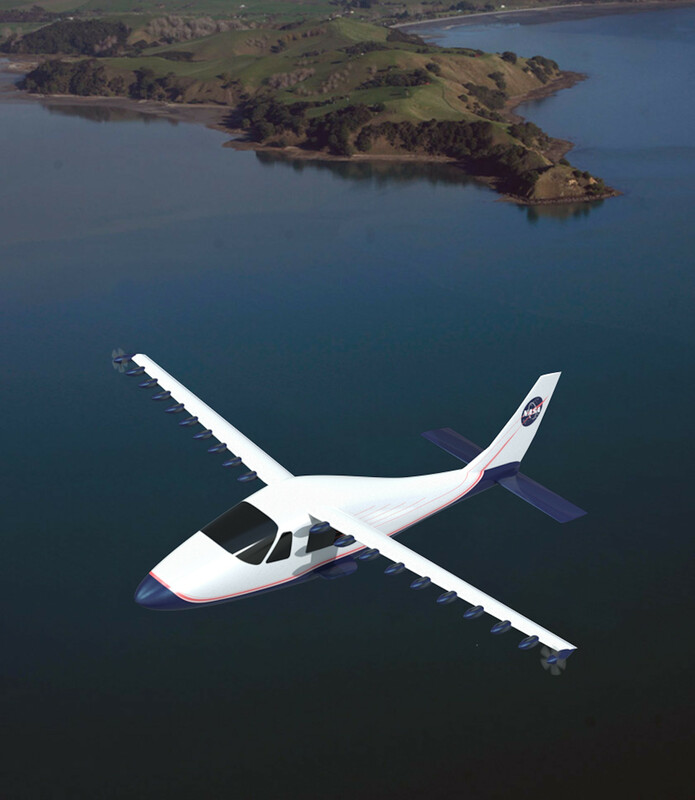 The tremendous and immediate lift generated by this octodecaprop plane and its mere 31-foot wingspan means it should be able to take off from runways as short as 2,000 feet, which is a good 700 feet shorter than the FAA recommends for small passenger aircraft." Is this related to a spinning wing (Magnus effect) or do the benefits accrue from some other aerodynamic effect? This appears to be a technology that would only benefit very small aircraft and would not be scalable, is this correct? The lift augmentation has nothing to do with Magnus lift (or the Coanda effect). It is simply an increase in the dynamic pressure across the entire streamtube of the wing. At the low takeoff and landing speeds (slightly above a 61 knot stall speed), the induced velocity of the propeller almost doubles the velocity that the wing sees; and the lift is a function of the effective velocity squared. But due to swirl and other effects the wing doesn't experience a 4x increase in lift, but about 2 to 3 times. The objective of the inboard propellers is not to achieve a high propulsive efficiency, instead we want those inboard props to achieve high induced velocities - think of them as part of the high lift system (which happens to also provide thrust redundancy). In fact landing is the critical case, and having lower propulsive efficiency (and a poorer spanwise lift distribution because of the swirl effects) is helpful in creating sufficient drag. The inboard props are not active in cruise flight, but simply fold against the nacelle (many motorgliders already do this type of folding on the nose). By only using the wingtip propeller at cruise, we're able to achieve a ~95% propulsive efficiency (versus 75 to 85% with a typical fuselage nose propeller installation). The reason for this is because we have lower blockage and scrubbing drag, as well as being able to take advantage of the strong wingtip vortex by rotating against it. Since electric motors don't experience a power lapse with altitude (because it's non airbreathing) we have far too much power at altitude anyway so by only using the wingtip motor it doesn't cause much penalty in motor weight (and electric motors achieve ~6x lower weight per horsepower than a reciprocating engine). In terms of batteries and range, the key is to achieve high efficiency cruise flight and it looks like with current batteries a 200 mile range is achievable. By adding a small <50 hp range extender motor, the aircraft will be able to achieve ~400 mile range. We're currently designing an X-plane that will fly in 2017 to substantiate all these numbers, with the ground test rig (wing and truck) providing an aerodynamic database to validate our analysis. Please note that I'm the NASA Principal Investigator of the LEAPTech Distributed Electric Propulsion integration approach, and the Convergent Electric Propulsion Technology (CEPT) X-Plane demonstrator. We have a team across NASA Langley and Armstrong, as well as two great small companies, Joby Aviation and ESAero who are retrofitting a Tecnam P2006T with a Distributed Electric Propulsion wing system. The main advantage would be similar to that of blown flaps. The flow around the wing will be slightly accelerated, so it operates at a higher effective dynamic pressure. This helps to prevent flow separation and allows to create more lift from the same wing area. This effect should be especially noticeable at low speed, when the relative speed increase in the prop wash is highest. Better field of view for pilot and passengers. However, once your batteries run empty, the plane should still be flyable to make an emergency landing, and for FAR part 23 certification, the minimum speed should not exceed 61 knots, especially not in this case. Therefore, the small wing chord of the pictured airplane looks awfully optimistic to me. Scaling this will not be hard in principle, but the bigger airplanes become, the harder it is to pack enough battery capacity. Bigger airplanes have higher wing loadings and fly faster, so their specific power needs are higher. For the next decades, electric propulsion will foreseeably not be scalable to transport aircraft. Not the answer you're looking for? Browse other questions tagged aerodynamics propeller electric-engine or ask your own question. Is there a special way to calculate the (parasitic) drag produced by the propeller?